I've been a little absent from blogging and it's all the Year of Organization's fault. Last week I went through all of our paper files, reorganizing them into 5 color coded categories and relabeling. That was about 7 hours of crafting time lost to organization (and I'm still not done!). Our cleaning service also started last week and between my quest to get rid of clutter and now a professionally cleaned house, I'm feeling like the Year of Organization was a great idea! Now onto the crafting. I made this blanket for my best friend April for her baby shower. At that time, we didn't know if it was a boy or a girl so I thought something neutral would be good. April's wedding colors were cream and brown so I went with that theme. Modifications: My gauge was really off so I had to cast on 20-30 more stitches to get the desired width. I also ended up using about half the yardage of yarn than what the pattern called for due to my gauge differences. 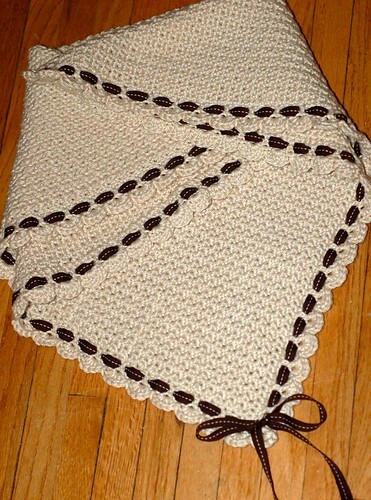 Even though the sizing was off, the beauty of this blanket is that you simply crochet a square then add the lovely scalloped trim. The ribbon detail and scallop really make the blanket special. Although my pics don't do it justice, the blanket is so soft, shiny, and just simply beautiful. I will definitely be making this again. Crocheting a baby blanket is much faster for me than knitting - so I'll be on the lookout for more crocheted blankets in the future. 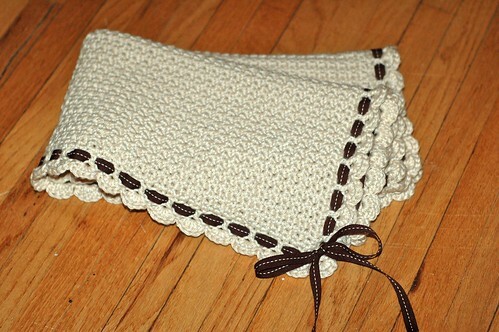 If you haven't used Knit Picks Shine it's one of my favorite yarns for baby items. It's soft, squishy, shiny, and machine washable - perfect for baby knits (or crochet).